Winter time is here and there is no better way to prepare your Metal Roof than to have Beautiful Color Match Snow Guards installed by Competitive Edge Metal Roofing, they keep the snow and ice from falling down in those damaging sheets and come in any color that you would like so that it will match your custom Metal Roof. 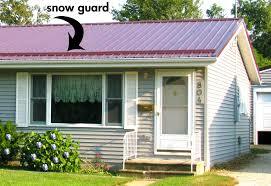 for more info please visit our Snow Guards Page for more info. They work by holding the snow and ice on your roof and letting it melt and drip off slowly so you don’t get those large sheets falling off all at one time and damaging shrubs and anything else that may be in the direct radius of your roof saving you time and money from clean and replacement of anything it may damage in the process. They can be installed cheap and quick for the peace of mind you will receive when you see that beautiful snow falling the cost is definitely worth it. Can be installed on most homes for under $500. They Screw directly through the ribs in your existing Metal and we guarantee no leaks. Call Competitive Edge Roofing Co anytime at (336)504-2776 and speak with Timmy Weaver to schedule your free No-obligation estimate today!